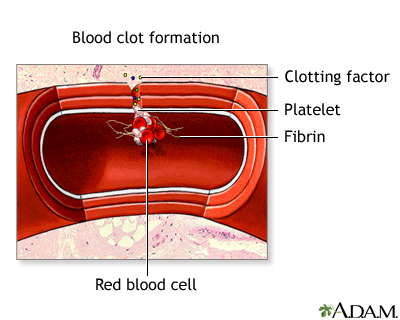 Blood clotting normally occurs when there is damage to a blood vessel. Platelets immediately begin to adhere to the cut edges of the vessel and release chemicals to attract even more platelets. A platelet plug is formed, and the external bleeding stops. Next, small molecules, called clotting factors, cause strands of blood-borne materials, called fibrin, to stick together and seal the inside of the wound. Eventually, the cut blood vessel heals and the blood clot dissolves after a few days.